This in an exciting time to own a technology company. Things are changing at lightening fast speeds, and there are more ways than ever to connect with peers, clients and prospects. There is an entire industry built on ways to connect with more of your prospects or clients, faster. The selling proposition for these software solutions can be compelling; do more with less, automate everything, hire fewer people. How is that strategy going to play out long term? There are some clear economic benefits for companies that choose to automate processes and drive customers towards self-service. Some clients and prospects genuinely prefer not to interact with live people – this is a coming trend, one that technology companies are just beginning to develop strategy for. Giving your clients what they want is going to be essential to the growth of your company. So, with such a wide range of prospects – clients that span across verticals, sizes and more importantly decision makers that span across whole generations, how is a company going to choose the right path? Automate or personalize? Full service or self-service? There are so many choices, and great arguments for and against all of them. It would be easy if you could just instill a sense of “golden rule” – just do unto others, right? Well, that’s a perfect solution, assuming those others are just like you. Your clients aren’t all like you. Your prospects aren’t all like you. How do you find the middle ground that will help your business appeal to everyone? I think you choose one or the other. You can choose to be a shop that provides amazing options for self-service, and by doing that, attract the kind of clientele that will want to click- click- click their way to a solved problem. You can use the best technology available, keep your headcount low, and market effectively to a specific, younger, emerging client base. You can choose to be a high-touch, white-glove service provider – your clients never have to lift a finger, they have only to make that one magic phone call and your team kicks into high gear, solving the problem for them, requiring no effort on their part past the initial contact. You can use people, process and technology to streamline, eliminate redundant activity, document and connect. Your goal is to provide the best customer experience possible to the clients that are attracted to this style of support, and who are happy to pay the white-glove prices you’ll charge. But what if you’re not yet in a place where you have the luxury to be so selective? As a new MSP trying to find your way, or an IT company making the move to MSP, the choices can be overwhelming, and turning away revenue may not be an option. So where’s the common ground? Paul went on to state that “partners who know what their expertise is going to be, and who are going deep to focus on that customer experience, are going to win.” It’s a good time to begin thinking about automating and personalizing in both your sales and your customer support departments – if you want to attract a certain type of clientele, you have to craft your sales messaging around that – and if you’re still trying to decide who you want to be, lukewarm messaging won’t resonate with either group. Ingram Micro stated today that they are committed to helping their partners find their way. 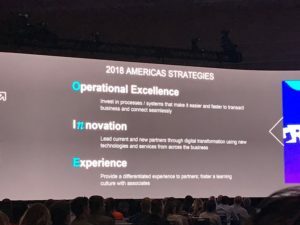 As Paul stated “consider Ingram Micro a 45 Billion dollar extension to your business!” That’s an offer that Ingram partners shouldn’t be turning down – there is help available from your partners – your distributors, your vendors – all of them are invested in your growth, so why not start getting them more deeply involved in your process? Find the best practices, compare with your peers, take advantage of joint marketing funds available to you. Let your partners help you craft the business you want to become – a 45 Billion dollar company has learned a thing or two about marketing – that education is available for any partner looking for it. Wondering how we fit into the whole ecosystem? Managed Sales Pros works with dozens of Ingram partners – vendors and solution providers – to give them a personalized approach to their sales prospecting. If you’ve decided you’re a white-glove provider, and you want to provide a white-glove experience from the very beginning of your sales process, we’d love to show you how our outbound prospecting services and inbound call answering services can help your MSP grow.